The first glimpse of Claude Giroux's superstar status came March 14, 2010, in the waning seconds of a game against the Chicago Blackhawks. As time was ticking down in regulation, Giroux flipped a picture-perfect saucer pass over two Blackhawks defenders that landed flat on Chris Pronger's blade for an easy deposit into the Chicago net with 2.1 seconds left in what became a 3-2 Flyers victory. Watching from the bench was then-teammate Simon Gagne, who was reminded of another ex-Flyer. "Maybe it's too early to make some comparisons with Peter Forsberg," Gagne told NHL.com, "but I did play with Peter, and he (Giroux) has pretty much the same style." Fast forward a year and after a preseason game Sept. 26, Jaromir Jagr had his own flashback while watching Giroux. Claude Giroux skated in his first NHL All-Star Game last season in Carolina. He had a great time, but he's got his sights set on the 2012 All-Star Game, which will be held in Ottawa. Giroux's family moved to Ottawa from his hometown of Hearst, Ont., when he was 14, and he played his junior hockey in Gatineau, Que., just across the river from the Canadian capital. Giroux said he would have a number of family members and friends who would flock to the game if he was in it. "Obviously it would be pretty fun, all my buddies are down there and all my family, too," Giroux told NHL.com. "Obviously it's something I would enjoy going back for. It was so much fun. For it to be in Ottawa, it would be even more special." "Mario Lemieux," Jagr said. "A little Mario Lemieux, a little bit smaller – but he can see it. … You have to be watching all the time, because you never know when the puck is coming." Being compared to a current Hall of a Fame member and a future one is pretty heady company for the 23-year-old native of Hearst, Ont., but that's the rarefied air Giroux has moved into 22 games into his third full NHL season. "It's a good compliment, but I'm still a young player," Giroux told NHL.com. "I don't compare myself to them. They're legends. I have a lot of stuff to learn." So far he seems like a pretty advanced student. His two goals Friday against Montreal game him 13, tied for second in the League, and his 29 points are one behind League-leader Phil Kessel. He also leads the team's forwards with an average of 21:24 per game in ice, including 2:43 per game shorthanded. He's also third among the team's forwards with 16 blocked shots. Giroux and the Flyers will Atlantic Division rivals Saturday afternoon in a contest against the New York Rangers, which can be seen on NHL Network at 2 p.m. ET. These two teams will also meet Jan. 2 in the 2012 Bridgestone NHL Winter Classic at Citizens Bank Park in Philadelphia. "He has been our best player, by far," said teammate Kimmo Timonen. "Every game he works hard, skates hard, making plays. … He's one of the better players in the League." "I think the most impressive thing for Claude … the skill is the obvious thing, but it's the way he competes," Flyers coach Peter Laviolette said. "His competitiveness is at a different level. I think that's why it's starting to show to everybody on a League-wide scale. People are noticing him. There's a lot of talented people, but when you compete like he did, it goes to a new level." People noticed it last season, when Giroux led the team with 51 assists and 76 points -- and played in his first NHL All-Star Game. They're noticing it now, starting with Flyers general manager Paul Holmgren, who cited Giroux's development as one reason he could trade Mike Richards and Jeff Carter during the summer. That pushed Giroux from a support player to the spotlight, where he would face opposing teams' best checkers and defense pairs, but rather than wilt from that challenge, he's embraced it. "When two of your best players leave … I took it as a challenge to kind of be the go-to guy offensively and defensively," Giroux said. "It's a challenge. Anytime you get a chance to play against the best players in the world, it's pretty exciting. Obviously it's a lot easier to motivate yourself to do that." That motivation has become contagious. 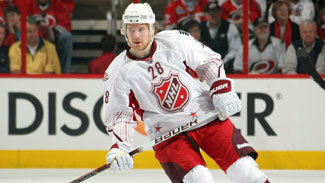 "He's got a passion for the game," teammate Scott Hartnell told NHL.com. "He gets fired up, which gets me fired up. It gets you ready to play every night." Hartnell said he knew from the first time he saw Giroux -- a two-game emergency call-up during the 2007-08 season -- that the youngster had something special. "Since his first game when he got called up from junior, you could sense the kid has that special gift of hands, work ethic," said Hartnell. "And he hasn't lost that, even though he's a big leaguer." Hartnell currently plays alongside Giroux, and when Jagr has been healthy, they've formed the team's best line. "He's one heck of a player," Hartnell said. "He's not a one-dimensional player. He can play both ends of the ice great, penalty kills, he's so good on the power play. Playing with him, I'm pretty fortunate." "It's one thing to be a top player on your team," Laviolette said. "When you talk about being a top player in the League, this year he's really spread his wings. It goes back to the (2010 Stanley Cup) Playoffs … he started to come out, I think, and really show what he's capable of doing on the ice. "Last year he was consistently one of our top forwards and now he's consistently one of the top forwards in the game." It's to the point where playing with Giroux has become the hockey equivalent of winning the lottery. "I would have wanted to play with him," Laviolette said. "I'm not good enough, but I would want to." "For sure," teammate Maxime Talbot told NHL.com. "I have the chance now on the penalty kill. It's something that's fun. Yes, your role is to kill the penalty, but … when you have a chance (offensively), 2-on-2, you might try it because he's out there. Yes, it's your job to kill a penalty, but you can do something special." Talbot said Giroux reminded him of one of his former teammates from his time in Pittsburgh. "He makes me think a little bit of Geno (Evgeni Malkin), how smooth he is," Talbot said. "I don't want to compare them, but how smooth he is and how he can make plays full speed and skate up the ice with the puck and you can't really angle him when he goes up the ice. And he does have that same kind of drive and passion to work to be an elite player." Giroux takes all the compliments and high-end comparisons in stride. "Anytime you come into the League you want to get better, you're learning," Giroux said. "My goal was just to come in and help the team win. And it's still the same thing -- try to get better, help the team win. If it's playing defensively or offensively, doesn't really matter. Just find a way to help the team get better."